The following article was written by Linda Dobbs, teacher at Sanders School, MSD of Wayne Township, Indianapolis, Indiana. Linda and Paws and Think both want to acknowledge McDonald’s Corporation for their monetary donation in enabling this perfect match to occur! Shelby was rescued from the Indianapolis Humane Society by Kevin Knartzer, certified trainer with Paws and Think, Inc. He told me there was something in her eyes that told him she would be a great dog…for any situation. About the same time, I was emailing Gayle Hutchens to inquire about the possibility of securing a facility dog for my special education day program, Sanders School. After meeting Kevin and Shelby in May of last year, we knew we had a perfect match. Who are the “Women of Worth” in your life? The snow has melted, warm breezes swirl about, and flowering plants and trees compete for your attention. Spring…it makes everything seem so worthwhile. As we draw close to Mother’s Day on May 8, we are reminded of women who have had monumental impacts on our lives…our mothers, grandmothers, wives, daughters, sisters and countless of other women… whose love and goodness have made our lives indescribably wonderful. 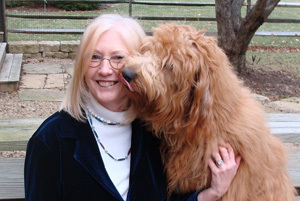 You probably recall that Gayle Hutchens, our Founder, was named, from thousands of nominations across the country, as a L’Oreal Paris Woman of Worth because of her work with Paws and Think. We want to pay this forward. Who are the "Women of Worth" in your life? How will you be honoring them this year? As one option, please consider making a donation of $50 or more to Paws and Think that will support our at-risk youths, canines at risk of euthanasia, individuals with special needs or disabilities, and many others like those who are working to improve their literacy skills, going through rehabilitation following their military service to our country, and are grieving the loss of a loved one. With your donation it will be our pleasure to send your loved one a card that informs her that you have honored her as a "Woman of Worth" in your life. And the first 100 honorees honored at the $50 or more level will receive a L’Oreal Paris lipstick with their cards. We will also feature their stories in our e-newsletter (with permission, of course). Since our inception in October 2001, Paws and Think has helped shape the lives of over 5,000 at-risk youths, saved the lives of over 350 canines and placed 25 service dogs with individuals and facilities. Through our portfolio of programs, people in need draw hope, skills and confidence to positively embrace the future, and shelter dogs go on to live happy lives with loving families and provide lives of service. Honoring a "Woman of Worth" in your life by making a gift to Paws and Think is a beautiful way to say thank you. Join us for Paws in the City, a glam evening with a New York City flair! It’ll be an evening of fun, fashion and cocktails on April 28th from 6-9 p.m. at Tavern on South near Lucas Oil Stadium (423 W. South St., Indianapolis , IN 46225 Map). A $10 cover charge gets you free hors‘dourves, a canine fashion show, a silent auction and the opportunity to recognize our volunteers. Specialty martinis, cocktails and wine and beer will be available for purchase with some of the proceeds being donated to Paws And Think. Additional appetizers will be available off the menu for purchase with some of the proceeds also being donated. Parking is available on the street or in a nearby parking garage ($2 for 1 to 2 hours; $5 for more than 2 hours). For more information, contact David Landau at dlandau@nullpawsandthink.org. Swisher Foundation provides operating grant to Paws and Think, Inc.
Paws and Think, Inc. has announced a generous operating grant from the Glenn Swisher Foundation. The grant will support the recent hiring of an Interim Executive Director as part of the organization’s succession plan. The Swisher Foundation was created by Indianapolis business leader Glenn Swisher. The Foundation has offered support for the organization’s dog training program for a number of years. The Board of Directors has hired Lynn C. Wilson to assume the position of Interim Executive Director, effective Feb. 1st. Lynn will assist Founder and Executive Director Gayle Hutchens with the transition of responsibilities in preparation for the hiring of a new Executive Director within the next year. Wilson was a Board member during the initial years of Paws & Think, and has been a long time supporter and donor. “I have long admired the mission and vision of Paws & Think, and I am pleased to play a role in this transformative time for the organization.” Wilson told the Board at a recent Planning Retreat. Wilson is the CEO of Crosby Wilson Consulting, a firm specializing in integrated marketing partnerships and maximizing corporate sponsorship investments. Join us for a special award ceremony! Paws and Think founder Gayle Hutchens will be named an “Indiana Hero” during the March 30 Pacer game at Conseco Fieldhouse! The Indiana Heroes Award, presented by Veolia Water, is awarded to an individual or group of individuals who, through their unique commitment and humanitarian spirit, have made exceptional and lasting contributions to our community. Does that sound like Gayle or what! Please plan on attending the game to cheer for Gayle and for all that Paws and Think does for central Indiana. Game time is 7 p.m. Be rowdy! Cyndi Cochran is the Indianapolis Branch Manager for Assured Healthcare and has been active member of the healthcare industry for almost ten years. Cyndi is a graduate of Purdue holding her Bachelor of Science in Biology. With the help of her two cats (Wesley and Zoe) and dog (Scout), Cyndi dedicates her philanthropic and personal time to her passion for animals. I’ve realized that my happiest times have been when I’m involved somehow with dogs, which I’ve always loved, and volunteer work. While my day job hasn’t been one to left much extra time for either of these things, my manager has encouraged me to find my work-life balance. It’s almost a cliché today, but it is more important than ever in our stressful world. I think my work-life balance began about 3-1/2 years ago when we got Mater, our Goldendoodle. We committed to taking him to obedience class from the first day we got him, and he still goes today. We began to make new friends there, mostly with the other Doodle “parents”. And we learned about Doodle Romps where they all get together and play. If you didn’t know it, Doodles are the most joyful dogs who recognize one another from blocks away! Mater was so outgoing and happy that he just seemed special somehow, and I realized that his enthusiasm for life was something to be shared. So I looked into training him for Animal Assisted Activities. Everyone I talked to referred me to Paws and Think. We signed up for the class and have been volunteering since then. Mater has brightened our world in so many ways, and I am grateful that he can share his joy in life with others. Paws and Think has provided us the opportunities to get involved both with him and with other people. Most importantly, I know that what we are doing makes a difference. I can see it in every face we meet as we share our lives with this great organization. If you are interested in volunteering your time (along with your pet) for one of the Animal Assisted Activity/Therapy programs, our next class begins on April 9th, 16th and 23rd! Please remember that prior to class, you will need to contact Carol Davenport at wellred_2@nullyahoo.com as well as complete and submit a screening tool. Pet Pals TV – February 19, 2011 from Indy ES Productions on Vimeo.